Following our three-month trip around Europe this summer I received several messages asking for information on costs/budget for our trip. I’ve managed to collate a log of all our spending during the 3-month trip and prepare a full breakdown of our spending for the entire trip. We spent almost a month in Norway which is one of the most expensive places to live/travel in Europe. We covered a lot of ground – 12 countries and 9,000 miles – so fuel/transport costs were proportionally higher. Our camper van is a Westfalia Columbus 600 – a 6-metre Fiat Ducato based PVC. A bigger vehicle would likely increase ferry/toll and fuel costs. 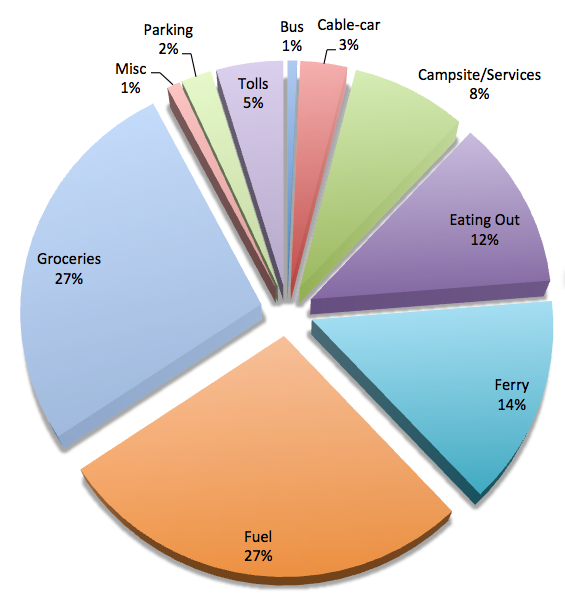 Transport costs – Fuel+Ferry+Tolls – made-up almost half (46%) of our costs. 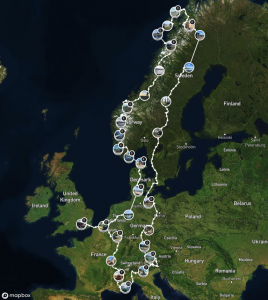 Ferry costs (£856) included £300 for Eurotunnel, £190 from Denmark (Hirtshalls) to Norway (Kristiansand), Bodo to Lofoten £95, Andenes (Lofoten Islands to Senja) £85, Denmark to Germany £105. Most expensive service point: 12 Euros (!) to empty the loo in Italy – we didn’t see the price on a busy notice-board and protested until the owner threatened to call the police. Bank Card: I used my Revolut card wherever possible due to it having no fees on international transactions, free ATM withdrawals abroad and its exchange rate being significantly better. It also has a great app which includes a number of handy security features and which helped me to track our expenses. Note that some UK cards don’t always work at un-manned petrol stations so ensure you have a couple of card options to hand. Cash v Card: In Norway we used card almost 100% – in fact we had to consciously make an effort to spend the Kronas we took with us. Card payments were predominant everywhere in Europe until we reached Italy where more places (including campsites and restaurants) would only accept cash. Groceries: After Norwegian grocery store prices we were staggered at the savings we made when we finally found a Lidl/Aldi in Germany. Lidl tended to be our go to option when back in mainland Europe. Tolls: We pre-registered with EPC who collect the tolls for Norways roads/tunnels. We had no idea how much they would come to but we received an invoice for £32 about a month after we returned from our trip, so pretty reasonable. We bought a vignette as we entered Austria (9 Euros for 10 days) though we never actually ventured onto an autoroute. In Italy/France we used the motorways for longer hops and paid the tolls. Offsetting Costs: For longer trips in the future we may consider renting out our property which would contribute to funding our monthly travel/living expenses. Our spend of circa £2,000/month was a function of the type/style of trip we did. Visiting 12 countries in 12 weeks meant a lot of driving and hence higher transport (fuel, ferry, toll) costs. Wild/free-camping significantly reduced our costs though we still stayed on campsites occasionally to do our washing and for me to access decent wifi as I worked remotely for several days while we were away. 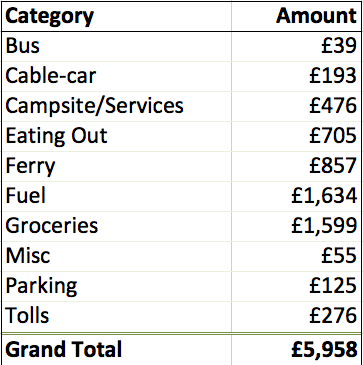 Our spend is in no way representative of a typical vanlife budget – we were still on holiday, though our discretionary spend was fairly limited. We could have cut our grocery costs if we made an effort and by cutting down the mileage we would have significantly reduced monthly costs, though traveling/exploring is the whole reason we purchased a campervan in the first place. Others have reported longer term vanlife costs of nearer £1,000 per month which I can envisage if you switch from a holiday to budget living mentality and reduce the amount of travelling. Overall I’d say we probably spent similar or perhaps a bit less than we would have done staying at home. The great thing about travelling in the van was the freedom it gave and that means you can make choices to suit every budget! And the value of the memories….priceless!! To see our full route including out stop-overs, photos and commentary click on the map above to hop over to our Polar Steps page or click here. ← Previous Previous post: A plan hatched and executed! How did you get on with dog food? Hi Sue, I find dog food a little dry for my own taste but Rosie seemed fine with it:). We took a large (15kg) bag with us which last for around 6 weeks. Then we resorted to buying smaller bags from supermarkets (Lidl/Aldi etc.) until we found some better quality food at a larger supermarket. We did notice that with the travelling and heat Rosie did reduce her food intake somewhat and lost a little weight.